Before the box braids, I took a picture of her last style. Her hair lasted for two weeks and could have lasted longer but I needed a more long-term style for school. I just wanted to post what the style looks like after two weeks. And this is just before I took the threads out. 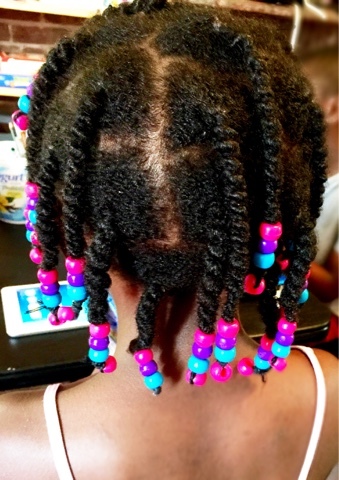 While she was wearing her hair in this style, I did not re-moisturize her hair at all. The hair-pomade was effective in sealing the moisture in for two weeks. Her hair was unbelievably soft and strong, full of moisture, when I took the threads out. This is a very good style for kids if you need a break for two weeks.